The Spring lobster season is in full swing here on Prince Edward Island. The spring lobster season runs from May until the end of June and the fall season from August to October. A good indicator of its presence is all the fresh lobster which starts popping up on the local menus! 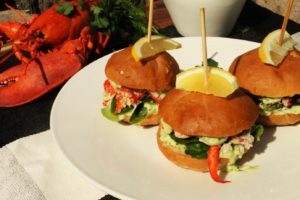 From the traditional Lobster Roll sandwich too Lobster Bisque and a multitude of other lobster dishes, every lobster lover can be sure to find something they will enjoy here on the Island. 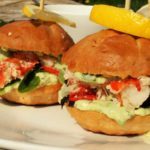 Keeping in tune with the traditional Lobster Roll, I decided to make Lobster Sliders this week! A Lobster Roll is essentially a simple sandwich made with fresh cooked lobster meat (seasoned and mixed with a little mayonnaise) and served on a fresh bun. Since we’ve had such great BBQ weather in the past few weeks, I felt like this slider recipe should be fresh, local, and above all easy to make! These Lobster Sliders fit all those requirements. They are an awesome seafood option to bring to a BBQ feast, take almost no time to make, and are packed with fresh lobster flavour. 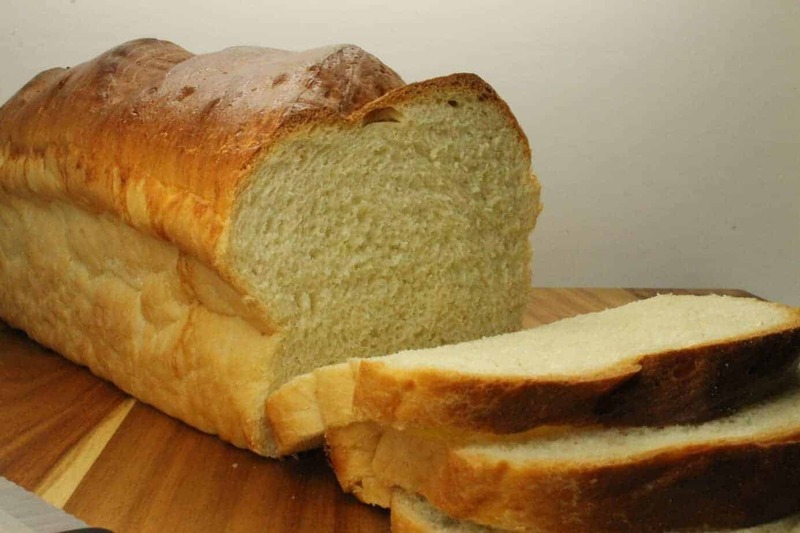 You can buy slider buns in advance or make your own (like I did) using this simple sandwich bread recipe. Instead of shaping the dough into bread loaves, roll out little balls, flatten them and then proof/bake to create your own soft buns! The lobster you simply need to boil in a pot of heavily salted water for no more than 12 minutes ( any more and it becomes tough). Once cooked, cool the lobster and take all the meat out of the tail, claws, and knuckles. You can save and freeze the shells for use in future soups if you like. Chop the meat and mix with 1 Tbsp of the mayo. You don’t want the mix to be to “wet”, add just enough to barely hold the lobster meat together. We don’t want to mask the flavour with the mayo! Season this with salt and pepper and set aside. The Cilantro and Avocado Mayo can be made while the lobster is cooking. Cut the avocado in half, remove the pit and scoop out the flesh. Chop 3 Tbsp worth of cilantro , squeeze half a lemon and measure out 3 Tbsp of mayonnaise. Place all of these ingredients in a bowl or food processor and mix it all together. The end product will look very similar to guacamole (and can be served as such if you like!). 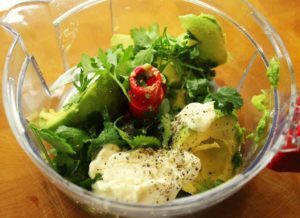 Season your avocado mayo with lemon juice (to avoid the avocado from oxidising and turning brown) and salt and pepper. Now all you need to do is assemble your sliders! I spread the mayo on the top and bottom of the buns, placed some fresh lettuce from the garden on the bottom half, topped it with the lobster meat and then closed the slider with the top half! Voila! 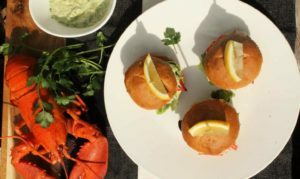 Delicious Fresh Lobster Sliders! This took me about half an hour start to finish (I baked the slider buns the day before), so it is a wonderfully quick recipe that you can put together for lunch or get together with friends and family. Let me know how your sliders turn out! As always you can follow me on Facebook, Twitter, and Pinterest, and don’t forget to Yum this recipe and add it to your recipe box on Yummly! 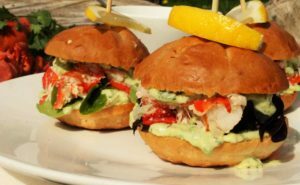 These Lobster Sliders are an awesome seafood option to bring to a BBQ feast. Easy, take almost no time to make, and are packed with fresh lobster flavour. Boil the lobster in a pot of salted water for 10 to 12 minutes. Cool and shell the lobster. Rough chop the meat and mix it with 1 Tbsp of mayo. season with salt and pepper. 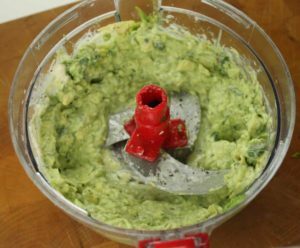 Mix the avocado, cilantro, mayonnaise and lemon in a food processor or bowl. Mix well until the desired consistency is reached. Season with salt and pepper. Prepare the slider buns by spreading the avocado mayo mix on the bottom half of the buns. Top with lettuce and then the fresh lobster meat. Close the slider bun with the top half and pierce with a skewer to hold the bun together. 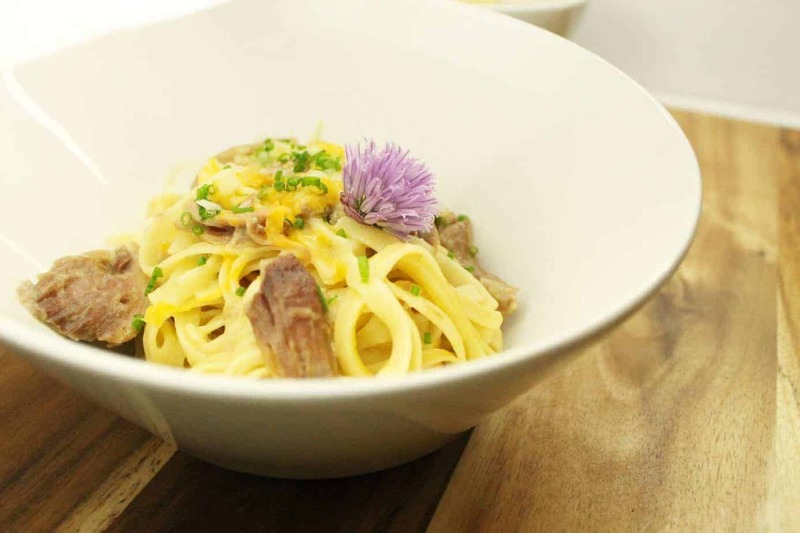 Garnish with cilantro leaves and lemon wedges. Markus, I’ve seen your name in our FBC thread and just haven’t read anything of yours before today. Nice to e-meet you! 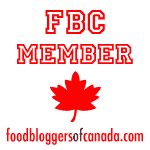 I am a Maritimer myself and I put my own lobster post up this week. ha,ha. I absolutely love how you wrote such a clear step-by-step about cooking the lobster. I think many people get intimidated as it’s an exotic item for most. Great tips. Also ‘it took my under 30 minutes’ to complete. Brilliant. I’m wishing you lots of sunshiny lobster filled days. Thank you Kellie! I agree that many are intimated by lobster when really it is so easy to prepare! Us Maritimers are little spoiled though, its not as easy and cheap to get everywhere. Love the sounds of these. Sure wish I lived by the water to get fresh seafood. Getting it at the store just is not the same. Last time I was in Nova Scotia I made sure I had some great lobster. Avocado and lobster sounds like a delicious combo. And your recipe is such a nice change from the traditional lobster roll on a hot dog bun. Thanks for sharing. Yeah! I wanted to change it up a little! The store-bought hot dog buns always put me of a little! Now your talking! Everything is so fresh. I’m sure there is not a morsel left after making these. Hi Markus, I adore lobster and envy you east coaster for your easy access to the freshest ones. These sliders look absolutely yummy! Thanks for posting. We are a little spoiled here when it comes to seafood! Mmm! These just make me want to go outside and chill out with a nice cold beer. They’re like summer on a bun. Plus it’s nice to shake it up and forgo the usual burger once in a while for something seafood-y!